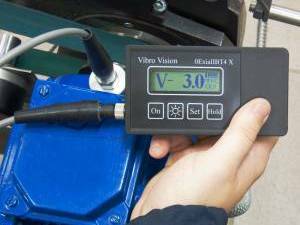 Compact vibrometer Vibro Vision is meant for checking vibration level and diagnostics of defects of rotary equipment. It also permits to measure general vibration level (mean-square estimate, peak, peak-to-peak), make on-the-fly diagnostic of state of ball bearings. Vibrometer registers signals in dimension of acceleration, velocity and displacement with the help of built-in or outside sensor. 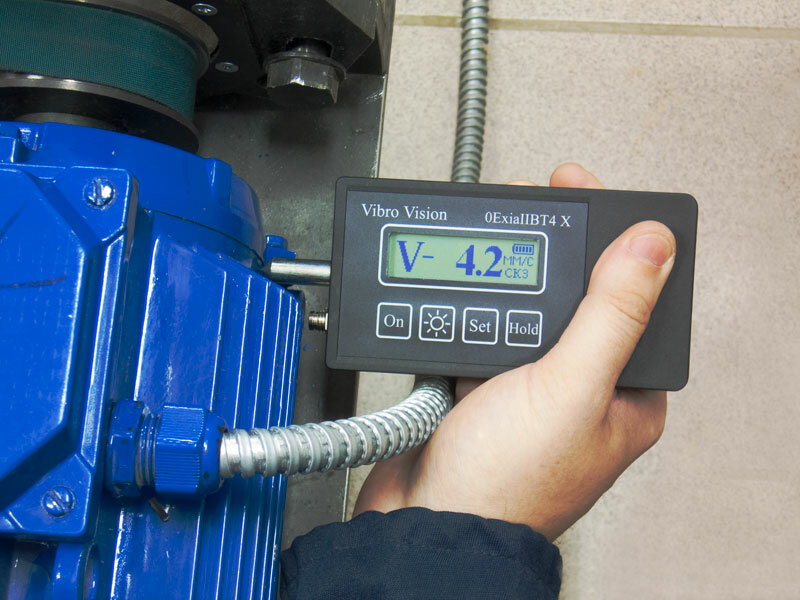 The picture presents measuring of vibration by device with the help of built-in sensor. In that procedure vibrometer is more envenient for easy and on-thefly measuring. With the use of outside sensor, which is placed on the controlled equipment by the help of magnet or with the using probe, vibrometer can make a complex measuring. It is presented on the second picture. 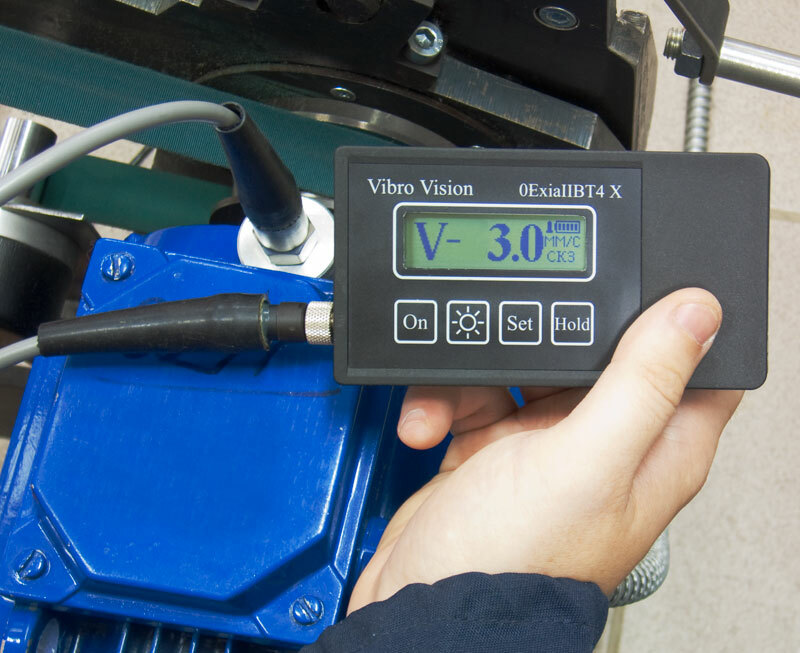 Additional functions of Vibro Vision are definition of state of ball bearing by calculation of Kurtosis of acceleration and primary analyzer of vibration. Vibrometer permits to evaluate the shape of the signals of vibration (512 points) and to analyse the spectrum of the signals of vibration(200 lines). 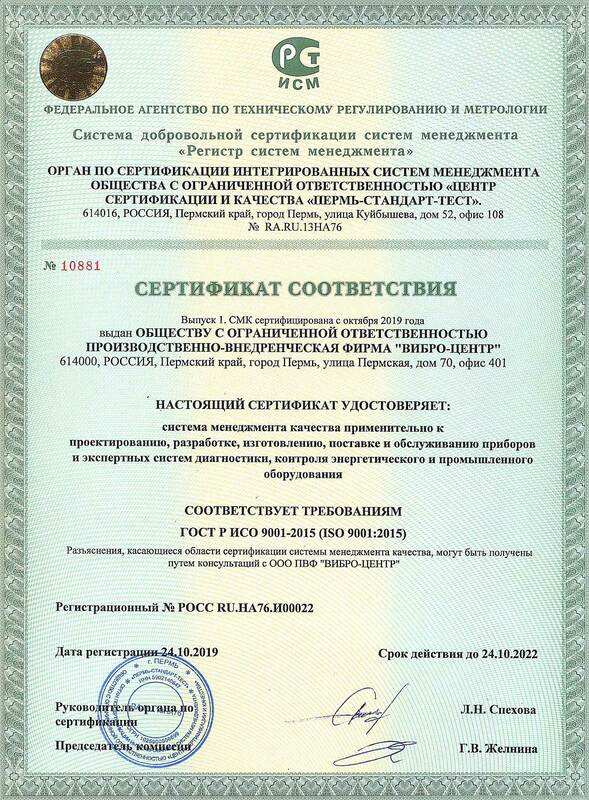 It permits to diagnose some defects, for example imbalance, on-the-place. All information in the vibrometer is presented on the screen of expanded temperature range, which backlight. The vibrometer can be used at the temperature of ambient air form -20 C to +50 C and air humidity about 98%, with out moisture condensation. Vibro Vision is charged by two in-built accumulators AA, which can be replaced by analogous. Diagnostics of ball bearing. This function permits to evaluate the state of ball bearing with the help of control mean-square sense of velocity and Kurtosis of acceleration. The Kurtosis is the measure of correlation percussions, noncyclic rectangular components in the signal of vibration to fixed and periodic rectangular components. This parameter defines upcoming defect. The bigger the size of Kurtosis the stronger is the blow in the bearing, attending the running of bearing solid of revolution the local defects, such as cracks, chips. The size of Kurtosis grows if there are considerable defects of bearing of absence. Analysis of waveform and spectrum of the signal of vibration. This function allows to discover encountered defects on the rotating equipment. On the left of the copy of the screen there is the shape of the signal, corresponding to the presence of electric motor rotor graze by stator. The example of the screen of vibrometer with the spectrum on the screen is corresponding to the presence of imbalance in the electric motor with the rotation frequency about 3000 rpm. All energy of the signal of vibration is concentrated on the rotation frequency of electric motor 50Hz. For example, with the presence of eccentricity, the spectrum has sizeable harmonic with the frequency of 100Hz.